If your T doesn't have a generator or alternator here is a handy trick using a diode and light bulb to trickle charge your battery. Warning: connecting the battery directly to the mag post will demagnetize the magnets and possibly damage the mag coil. It is really important to orient the diode in the proper direction when connecting the charger to the magneto/battery. A diode is a valve that lets electric current flow in only one direction. Diodes are rated by the amount of current they can carry and by the amount of reverse voltage they can stop. Generally when a diode fails it allows current to flow in both directions. A diode makes the magneto battery charger possible for two reasons: it blocks current flow from the battery to the magneto (which would demagnetize the magnets), and, it sends the positive half of the magneto’s alternating current to the battery. 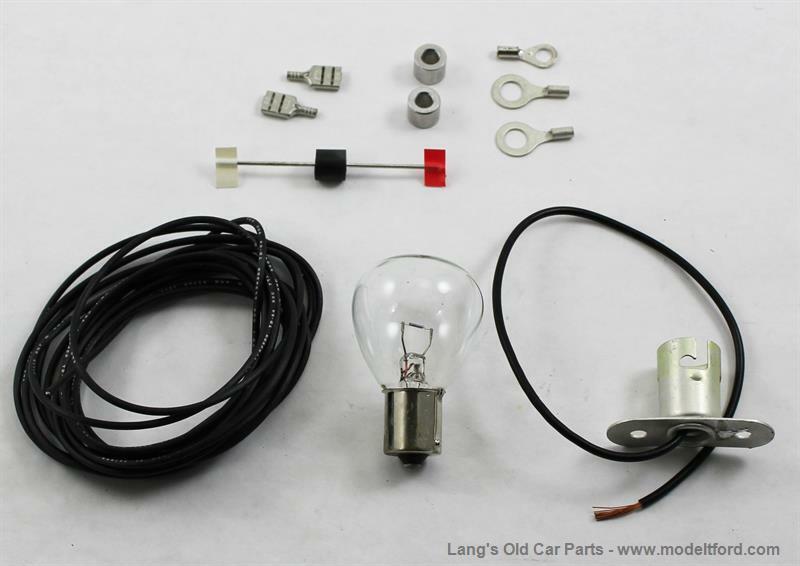 The magneto battery charger has three parts: a diode, an incandescent bulb and a bulb socket. The bulb acts as a ballast resistor and a fuse. It limits that amount of current allowed to pass from the magneto to the battery. If all the current went to the battery there would be none left to energize the coils. When the engine is idling the bulb hardly lights up. As the rpms increase the “mag” puts out more power causing the filament to heat up and glow. The hot filament resists current flow so the current takes an easier route through the coils. If the diode fails the bulb acts as a buffer limiting the current that could discharge the magnets. If the bulb glows when the engine is not running the diode has failed. Remove the bulb until you can replace the diode. Too much power and the bulb will act like a fuse and burn out, again protecting the magneto. I used a 1N5402 diode which is rated at 3 amps and 200V peak repetitive reverse voltage. I purchased several of these diodes years ago after reading an article by John Reagan. I haven’t heard or read anywhere of a failure if this diode. A strong magneto puts out about 28VAC. To build the charger solder the “battery” lead from the diode to the side of the bulb socket, encase the diode in heat shrink tubing and seal the ends with some liquid electrical tape. Diodes don't like water. Connect the magneto lead from the diode to the terminal block screw where the magneto wire attaches. The wire from the bulb socket is then attached to the main power feed from the battery at the terminal block. If the bulb lights up the connection is backward. Use the diagram above as a guide. If you prefer to leave the engineering to an expert you can get a charger from Lang’s or from the manufacturer, John Reagan, at Fun Projects.